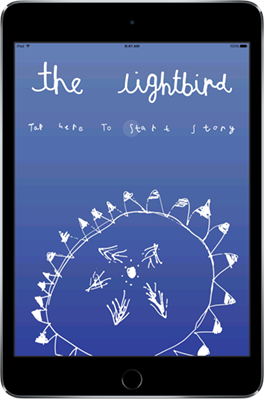 Mousepickle’s most recent app, The Lightbird, is an animated storybook devised and illustrated by children, for children. With an immersive soundtrack, and a unique storyline (featuring naughty bears, grumpy Santa, a kindly Elf, and of course the magical Lightbird itself), The Lightbird is perfect for solo readers aged 6 and above, or for reading with a parent at any age. You can read more about The Lightbird, and find brief instructions on how to use it.